Scientists think this dinosaur was about 18 to 20 feet long, based on the size of its skull. What they don’t know, though, is whether the specimen they found was a full-grown adult. If it wasn’t, the dinosaur might be a lot bigger. When the dinosaur was discovered, the media labeled it “dwarf dinosaur from the Arctic.” It’s true that this dinosaur was found in the Arctic, and it is only about half the size of T-Rex. But it’s hardly a dwarf compared to other dinosaurs. More medium-sized. And that’s if it was an adult. Because it lived in an area that was dark for much of the year, food was probably scarce, which might explain why it wasn’t as big as its relatives. The Nanuqsaurus lived during the Cretaceous, about 69 million years ago. During this time, the Arctic was cold, but probably not as cold as it is now. It was probably much warmer during the summer months. There were periods of complete darkness and complete light, as there are now. The Nanuqsaurus was a meat-eating dinosaur, related to T-Rex. It was discovered in 2014 so we still have a lot to learn about it. Question: Was this dinosaur white like a polar bear? 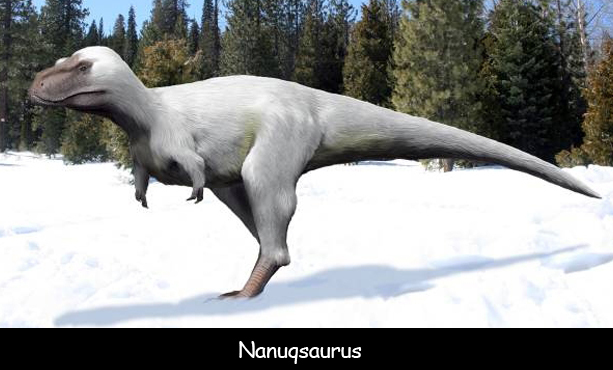 Answer: The Nanuqsaurus is sometimes depicted as being white because it lived in the Arctic. It’s possible, but no one really knows for sure. Visit the BBC to watch a video about this dinosaur. Declan, Tobin. " Facts about Nanuqsaurus for Kids ." Easy Science for Kids, Apr 2019. Web. 21 Apr 2019. < https://easyscienceforkids.com/nanuqsaurus/ >.